I last did the Pelion Circuit in glorious weather in 1993. With this latest walk we waited until there was a good forecast, which by good fortune meant only one day delay. On the first day the predicted showers looked a bit ominous as we drove through heavy rain from Mole Creek, but the worst had passed by the time we pulled up to start the walk. The initial track was one slightly further south than the conventional Arm River Track. It was from an offshoot of Maggs Rd and although no quicker it avoided the steepness of the normal route. It was obviously used frequently and several sizeable logs had been chainsawn through the ease the way. Much of the upper section follows a narrow valley with numerous pencil pines and is most attractive. In the days prior to the walk there had been snow and rain about and this left plenty of water with the creeks well up, including Douglas Creek at Pelion which would have been very difficult to cross if it was not for the bridge. 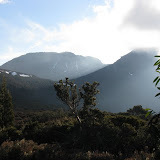 We all favoured staying at Pelion hut instead of continuing on to Frog Flats. Morning revealed a light snow cover but it didn't take long for it to melt and it has disappeared by the time we reached the Pelion West turnoff. Just before the first small cliff line of the mountain we debated whether to take a direct route for the big cliffs on the southern side of Pelion West or continue up a bit before doing so. The direct route was chosen, but in hindsight the longer way would have been easier. It took us 2 hours skirt under these massive cliffs with considerable amounts of snow on the slopes under them. Even though this route avoids the summit boulders, there was still a short 80 metre section of large rocks that needed great care to negotiate. Camp was on the high ridge on the western side where a group of small pines provided shelter from the cool breeze. Nigel and James climbed Pelion West. Although the following morning was cloudy it did not take all that long for it to break up as the day got progressively better and better. The packs were left on the upper slope of Achilles as we journeyed out to Perrins Bluff; a trip that took us a little over 2 hours with scrub, rock and snow and much the same for the return. Whilst Nigel and James ascended Achilles, I decided to go down to Leonards Tarn. I was aware that it was best to keep to the far right of the grassy descent gully, but progressed down to the first of the Fagus and realised that I should have turned right earlier.Thinking this would only be a narrow band at this point, I chanced pushing through to where I should have been. However it wasn't easy and would have been better and quicker to have backtracked and gone round. It is deceivingly longer to get down to Leonards than it looks, but after finding a nice campsite it was delightfully pleasant wandering about and taking photos at this beautiful location. Morning brought another fine day and more time strolling about this delightful spot before embarking on the long and unrelenting 2 hour climb up the boulders to the Thetis summit. Getting off was harder than it ought to have been because we missed a cairn and went over a lot a large boulders that were not easy with a pack on. Camp that night was in a pleasant bit of snow gum woodland with the final morning was taken leisurely over the moorland before dropping back to the Overland Track. It was almost 6 pm when we arrived back at the cars as the first drops of the predicted late rain fell. There is a photo album on the web. Nice looking walk Peter. I might have to put this on my 'to do' list!